As a kid I was a reader. You know the type. I always had a book in tow. I read at recess, at lunch, during boring classes (what?). I rocked the summer reading program, gamed my mother's summer "pay you to read" system, and raided my parents' bookshelves. Somewhere along the way though, I lost the library. I don't know exactly when it happened--I have fond memories of perusing the stacks at our local library (and climbing the trees outside). My guess is that I outgrew the kids section and what I wanted to read (science fiction and fantasy) wasn't well represented. It may be that I started having more of an interest in keeping my books. I'm really not sure. I do know that my mother kept me pretty well in books (thankfully fantasy novels are cheap in paperback) straight up through high school. Landing in college should have been bookish nirvana. Instead I stopped reading almost entirely. The reason? It was too engrossing. When I get in the middle of a good book, I tune out. For hours. I lose myself and all sense of time. And who could afford to do that with papers to write and homework to do? So I just didn't. In the years since, I've developed a taste for business books and other light, readable non-fiction. It's easy to get through, usually teaches me something, and doesn't turn into a giant black hole. Unfortunately, those books are not cheap, so I typically only buy one when I have a long plane trip ahead of me. (Read once or twice a year). I still read, but not books. The hubby and I have long subscribed to TIME, and other magazines have come and gone. And, of course, I have an rss reader stuffed with blogs--cooking blogs, mommy blogs, photography blogs, quilting blogs, local blogs, feminist blogs, general life blogs. All of which are interesting and often teach me things, but none of which give you the depth of a book. A friend recommended Think by Lisa Bloom, so I added it to my wish list. My hubby thought it looked interesting, so a copy was waiting for me under the Christmas tree this year. The book details the impact of not thinking and lays out some guidelines for carving out the time and resources to read more. To think more. I finished it yesterday and went this morning and signed up for a library card. 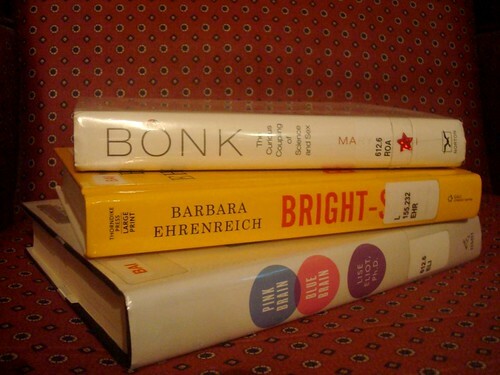 I have three shiny new-to-me books sitting next to me as I type this. One that has been on my to read list for ages, one recommended in Think, and one that just looked interesting so I grabbed it. Three books. Free. How could I have ever forgotten the magic of the library? The sheer possibility of all those books, and any of them can come home with you. I walked out giddy and beaming. And now that I look, I see so much free time in my schedule. Lunch, which I usually spend reading blogs? Why not a read a book? Even a half an hour after dinner would quickly add up into book after book. I am tired of feeling half informed on the major political issues of our day. I like knowing facts; I crave more than soundbites. Reading supplies that along with alternate points of view, new takes on old subjects. I'm a quick reader, I could easily breeze through 2-3 books in each 2 week lending period, if only I would pick them up and read. And so I will. I am making a commitment to myself. To make reading a habit again. To make going to the library every two weeks part of my routine. Return the old, take out new, and read them all. I currently have 24 books on my to-read list. By the end of the year, I hope to have gone through all of those and then some, and to have a to-read list even longer. My plan is to post a picture here each time I come home with new books. I might post reviews. I might not. But I'm going to strive for at least a picture, proof that I am, indeed, making to the library and back. Oh reading... I reduced reading for fun during university, but I didn't completely stop. But this fall, I had a time when I was not carrying a book around with me; I just could not sit down to read. It was a horrible time. Luckily, now my reading habit is back! I made a challenge to myself to read more in 2012. Check out Good Reads too if you have't already.